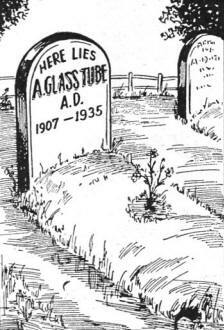 The advent of metal-encapsulated vacuum tubes was supposed to be the death knell for traditional glass tubes. This 1935 article from Radio-Craft spelled out the many virtues of 'metal' tube and how in short order their superiority would obviate the need - even desire - for 'glass' tubes. I'll let you read the article for the details, but want to make note of an evidently archaic term used that could potentially be really popular in today's manufacturing world if duly resurrected - 'quantiquality' (aka 'quanti-quality' or 'quanti quality'). The connotation is a process of high quantity in conjunction with high quality. The only references I could easily find to quantiquality was from late-19th-century newspaper archives. If sometime within the next few years you start seeing some form of quantiquality appear in marketing copy and scholarly papers, remember that you heard it here first! Interesting details concerning the all-metal tube; also, recently-introduced, associated types are described. Metal tubes - being more compact, inherently strong in structure and having many manufacturing advantages over glass tubes - fulfill an urgent need in the field of applied electronics. Fig. 1 - Table I lists the above details. As the artist has expertly illustrated, Fig. B., the glass tube design that has held sway for the last 28 years at last has succumbed to the modern demand for "quantiquality" (a word coined by Sachs which aptly typifies the modern demand for greater production and closer tolerances)! The case against glass tubes is a strong one, but only a few important points will be mentioned. 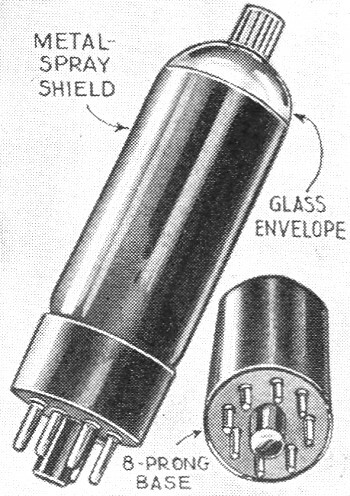 That there is little difference between the elements inside the glass and the metal envelopes is evident by reference to Fig. 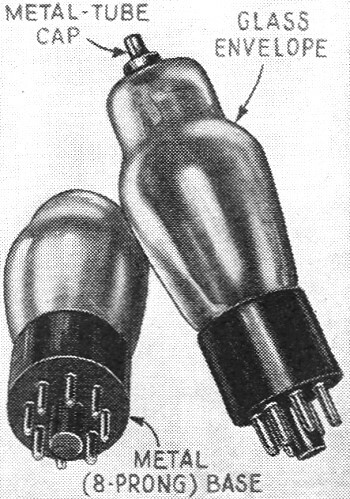 F. This view shows that a great amount of material required in order to secure rigidity within the necessarily large glass bulb, is not required in a metal tube. The metal tube structural requirements previously mentioned, and some of those hinted at, will be evident by reference to Fig. 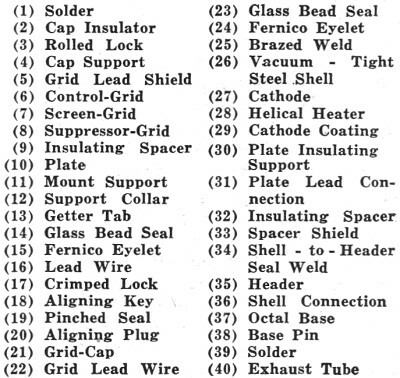 1, which illustrates a typical screen-grid tube; a description is given in Table 1. At the same time, the metal envelope is much superior and more convenient in its function as a metal shield and in reducing inter-electrode capacity than is the skin-tight shield required in a good glass-tube arrangement. Present circuit practice demands that the grid-to-plate capacity of a typical screen-grid tube be approximately 0.01-mmf., or less. The metal tube reaches this tolerance with little difficulty. Fig. B - Going-going - - -! Fig. C - "Metal-spray" tube. Fig. D - Metal-glass tube. Fig. E - Glass-"metal" tube. X-ray eyes would- be required to see "through" the opaque metal tube. Therefore, what is more logical than that the X-ray should be used in checking the internal arrangement of the elements in defective tubes? This procedure eliminates the need for an expensive wrecking process in order to check the malformation of the elements within the normal number of tube rejects. The internal arrangement of the elements (in screen-grid arrangement) as thus disclosed by X-ray is illustrated in the central view in Fig. A (and the cover illustration), and may be compared with the exterior and cross-section views at the left and right. X-ray views of the representative types appear in Fig. G. This photograph and the preceding X-ray view were taken by the General Electric Company especially for Radio-Craft; (they are interesting examples of the advanced X-ray photography technique which makes it possible to obtain such excellent "separation" of the various metal elements within the steel jacket). Fig. G - G.E. X-ray photos of metal tubes. An article discussing the present status of metal tubes would be incomplete without mention of several new technical developments in related types. The consumer should acquaint himself with the following facts in order that due justice may be given to all concerned. A Canadian manufacturer, Rogers Radio Tubes, Ltd., has just introduced a type of tube which at first glance might be confused with the steel jacket variety. However, as shown in Fig. 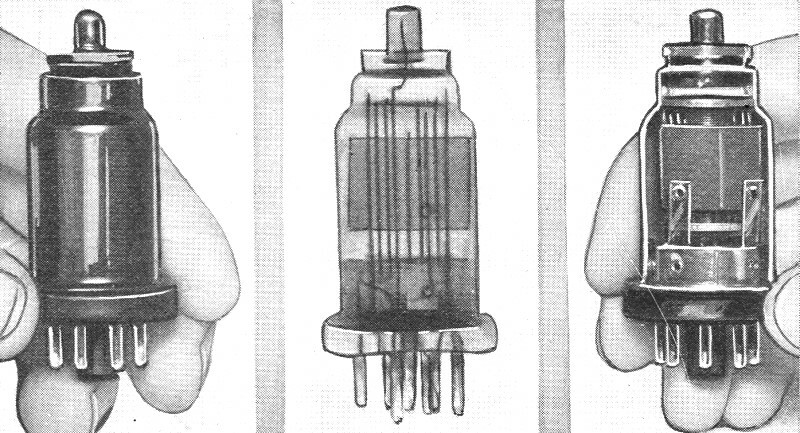 C, the envelope is of glass, and only the "octal" (8 prong) base is of the metal type. The glass bulb is given a metal coating; from this process is derived the term -"metal-spray" tube. The metal-spray tube is completely shielded from top to the bottom of the base; it is furnished in dual-purpose types. The new interior construction of the tube includes the cementing of the grid rod to the ceramic top-support, together with expanding and sealing of the cathode tubing to this ceramic support. This eliminates the possibility of noise due to vibration, as well as the possibility of hum from the cathode tubing or poor emission from the cathode coating. Fig. F - Illustrating metal vs. glass tube type. A second variation has been brought out by Triad Manufacturing Company, Inc., and is illustrated in Fig. D. These metal-glass tubes are known as the MG series and are not all-metal, there being a glass inner sleeve which is used for maintaining the vacuum. The MG series at present, includes the following types: 5Z4MG, 6A8MG, 6C5MG, 6D5MG, 6F6MG, 6H6MG. 6F7MG, 6K7MG; the characteristics of these tubes are said to parallel those of all-metal construction. There is available in addition the following types, for use in A.C.-D.C. sets: 25Z5MG and 43MG. with characteristics similar to those of the types 25Z5 and 43 tubes; there is also available a type 50A2MG tube, which is a ballast tube in a metal shield with a tap to supply two No. 40 pilot lights in series, and type 50B2MG, similar to the 50A2MG except that it is tapped to supply only a single No. 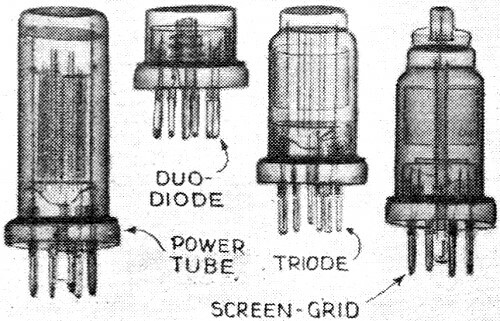 40 pilot lamp. Both ballast tubes have an over-all drop of 50 V.
The tubes in the MG series incorporate standard octal bases. Finally, there is the type of tube which, while it incorporates an octal or 8-prong base, utilizes a glass envelope and depends for its shielding upon an external shield. 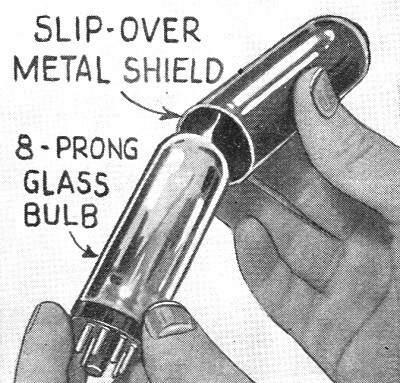 This glass-"metal" tube described in the August, 1935 issue of Radio-Craft as item No. 754, is illustrated here in Fig. E. The characteristics are said to approximate those in the regular metal series. The latest step towards securing identical characteristics has been to use a skin-tight shield of improved design. This shield is illustrated in the Latest in Radio Department of the October issue as item No. 820. The glass-"metal" series, identified by the suffix letter G, is a product of Arcturus Radio Tube Co. It is interesting to speculate on how many manufacturers of test equipment may have provided switches to take care of the unavoidable discrepancies that so far have arisen in the "standardization" process in connection with metal tubes. We refer specifically to the types 6F5 and 5Z4 tubes. 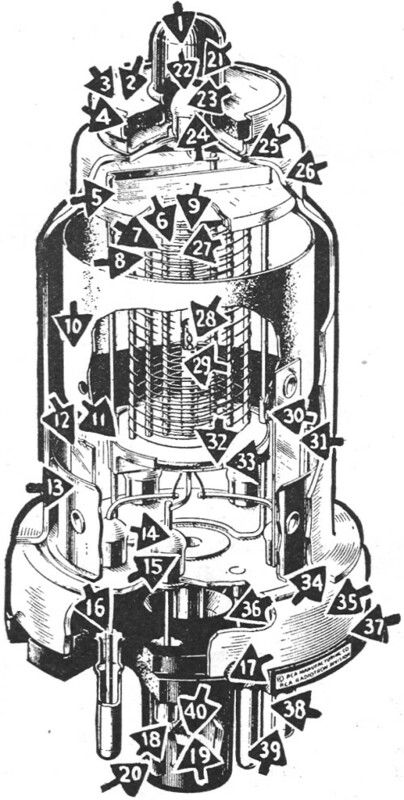 Metal 6F5 is a high-mu triode, with its plate connected to No.4 terminal instead of the No. 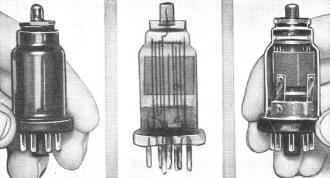 3 terminal utilized for plate connection in the other amplifier tubes in the metal series. This connection to No. 4 terminal eliminated undesirable circuit regeneration. Service Men and experimenters who wish to revamp existing equipment in order to properly test the metal tubes should note that some analyzers have the No. 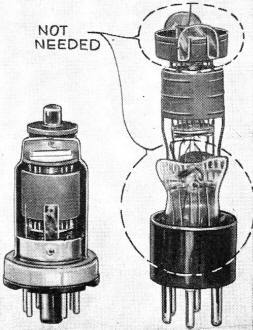 1 or ground terminal of the octal socket grounded to the metal mountings and the wiring - at the same time, the No.8 terminal is grounded. This puts the tube shield at the rectifier cathode potential - that is, 350 V., in some instances! (An army mule can't beat the kick you'd get from that jolt!) Just remember, then, to isolate the wiring to terminals 1 and 8. Heating of the metal tubes, as compared with the glass type, is a popular topic for discussion these days. Do the metal tubes run hotter than the glass ones of equivalent type? If they do, and the rise in temperature is due to better conduction by the steel envelope, is this an indication that the tube will perform better because the internal elements are being kept more cool? 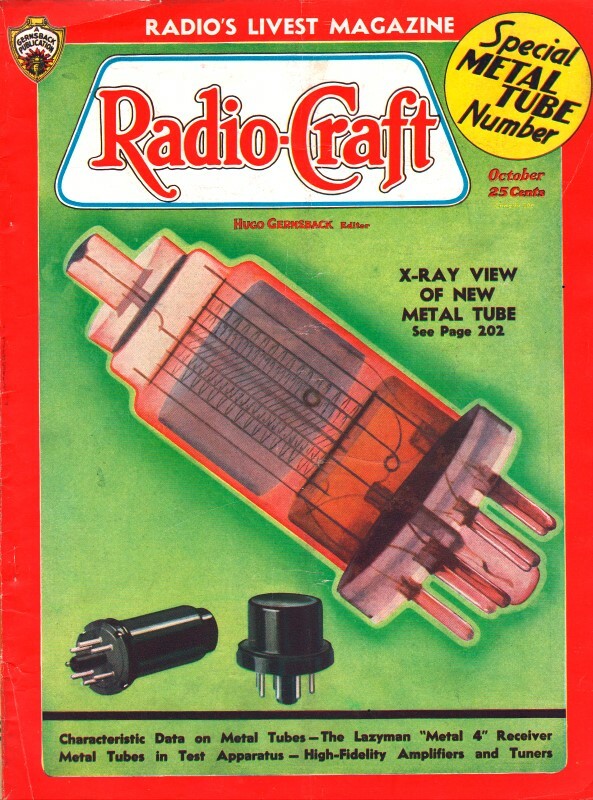 These and other questions of this nature are still to be answered; it is of exceptional interest that an article discussing the subject will appear in a forthcoming issue of Radio-Craft. 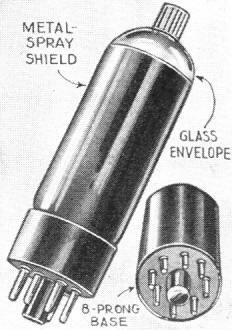 Some off-hand claims have been made that the metal tubes are less sensitive and more noisy than the glass predecessors. On the contrary, comparative tests between receivers utilizing similar sets each properly designed, one for the metal tubes and the other for the glass prototypes, prove that the metal tubes are more sensitive and less noisy than glass tubes! Finally. there remains the question of whether the metal tubes will work at very high frequencies. Well. 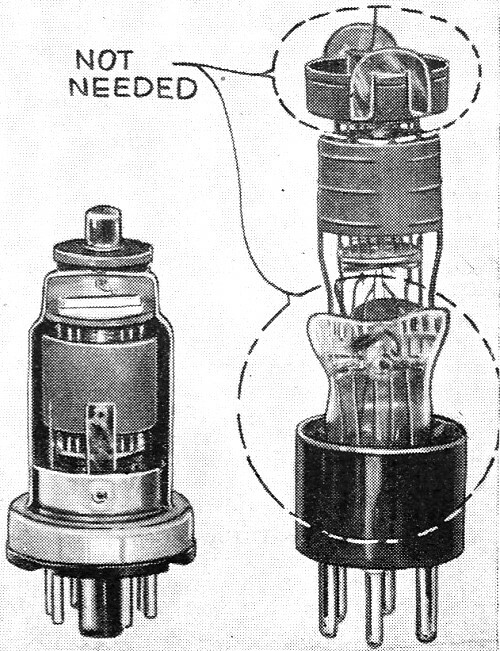 the writer is in the position of having heard a commercial metal-tube set (described elsewhere in this issue) operating on 4 1/2 and 5 meters! It functioned with far greater tone quality, and far less static at 5 meters than did the same set at the broadcast wavelengths! It seems, however. that in some circuits the shield of the metal tube when operated at ultra-high frequencies may exhibit hand capacity. Whether this is due to lack of conductivity of the Swedish-iron shield, to close proximity of the internal elements, or to some other reason has not as yet been definitely determined. 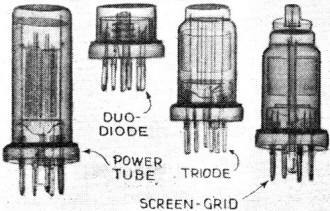 It is even possible that the control-grid terminal atop the tube, in some high-gain circuits may present sufficient area to cause inter-tube feedback and circuit oscillation or undue regeneration. An expedient to obviate this fault is the use of a top-cap shield, constructed as illustrated in Fig. 2. Fig. 2 - This metal cap completes the shielding. Definitely, metal tubes are here to stay. Therefore, the radio man might just as well start right now to absorb every available bit of technical data relating to them.